We monitor the butterflies at Carymoor by walking along a planned route that takes in a variety of habitats attractive to butterflies. This route is called a transect and is walked weekly between 1st April and 30th September. It is divided into sections which represent the different types of habitat. The recorder walks slowly along the route doing his best to record each specimen and species without missing any or counting an individual twice - a tall order sometimes! The main objective is to monitor the ebb and flow of the species present on site from year to year and build up a general picture of the wellbeing or otherwise of each species over a period of time. 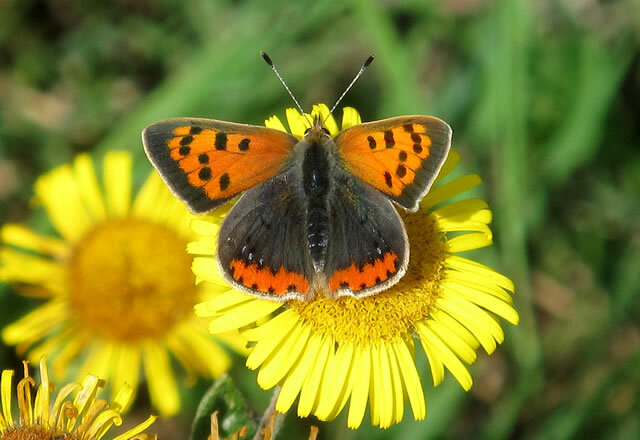 The results are sent to Butterfly Conservation, along with data from all the other transects walked around the country contributing towards a national picture. The count cannot be precise as butterflies tend to fly erratically and one species can become confused with another if you don't get a very close look. For instance, a green-veined white and cabbage white look identical in flight but when they settle the difference is more obvious! In the case of the Small Skipper and Essex Skipper, you need to examine the colour of the tip of the underside of their antennae to be sure! It was only comparatively recently that they were identified as separate species. The Essex Skipper, named as such because of the locality of the first identification - its range has now extended as far west as Wales. I hear someone say "what does it matter if one of two look-alike species doesn't survive - what difference does it make?" In the short term the answer as far as the ordinary punter in the street is concerned is absolutely none - but is that the end of the story? This is a small part of a bigger question about why we should protect and promote biodiversity, upon which the welfare of our planet is dependent. Consider our place here within a thin veneer of soil and breathable air, perilously suspended between molten magma and a hideously hostile vacuum. Even if you are reluctant to believe in global warming, is it really worth taking the risk by being complacent? Losing a small, inconsequential butterfly might seem to make no difference, but butterflies are a barometer of the well-being of an ecosystem and are the first things to disappear when something is amiss. The loss of a whole habitat like the rain forest, which some of our species are hell-bent on realising, could have a cataclysmic consequence for the planet's climate - and us. Let's get back to the Butterfly Transect and another inconsequential butterfly, the Brown Hairstreak. This species is probably the rarest and most vulnerable we have at Carymoor. I have seen just six specimens here in the past four years and only once whilst performing the transect - on the 3rd September this year. 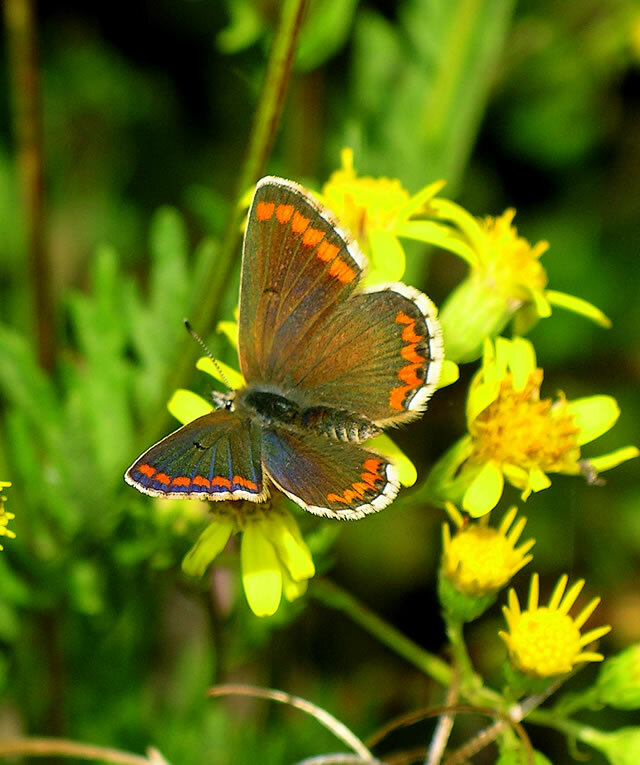 Although the Brown Hairstreak is rare, its food plant is quite common. Its larvae feed exclusively on Blackthorn - a shrub that is endemic in the hedgerows in this part of Somerset and which are laden with sloes at this time of year. There is a significant reason, however, why this attractive little butterfly struggles to survive. Most hedgerows here and in other parts of the county are annually flailed. The problem is that this is done in the winter months and the butterflies' eggs, which are laid in early autumn, are destroyed. Quite obviously we don't expect farmers to all suddenly stop flailing their hedges to save this butterfly, although Countryside Stewardship scheme grants were until recently available for those landowners who have the time and the inclination to manage their fields and hedgerows in a more wildlife-friendly way. At Carymoor we do our best to manage our hedges in a wildlife friendly way for this butterfly. 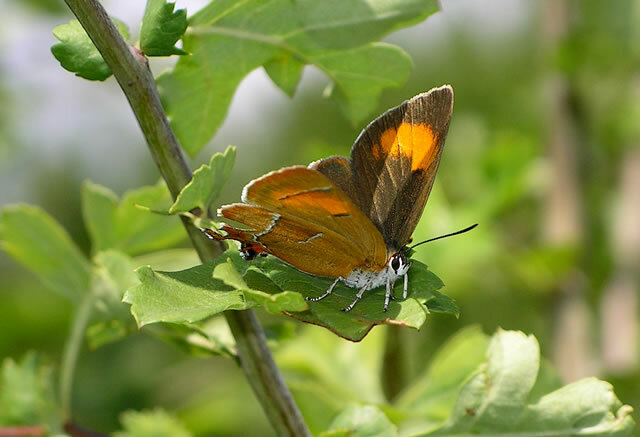 Traditionally, hedges were laid in comparatively short sections annually, so that each section would produce strong new shoots - which the Brown Hairstreak happens to prefer. This has the advantage over mass flailing in that most of the butterflies' eggs can survive. 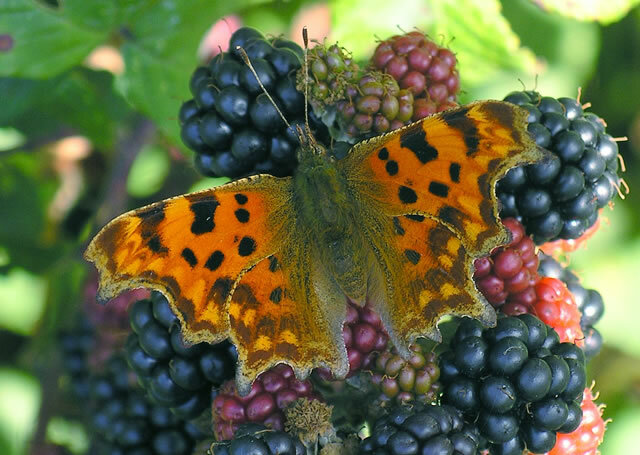 The profile of this butterfly was dramatically raised in September 2009 in an episode of the Archers on Radio 4, when one was seen by the character Lynda Snell. This serial often raises current topical countryside issues and someone at the BBC deemed the plight of the humble Brown Hairstreak as worthy of promoting. Apparently, the area of countryside to the east Worcestershire, on which the Archers is based, is a stronghold of the Brown Hairstreak. The ebb and flow of species resident at Carymoor is often due to climatic and other events that are outside our control. The last two summers have been very wet and that has had a detrimental effect on some species. Generally however, data gathered from this year's transects indicate that most species are doing well. All that is brown and orange is looking good! This autumn! Very well spotted, crazy-eyed butterfly guru! I googled to make sure (trust issues), and updated accordingly. Cheers very much! 10 points to Stewart.